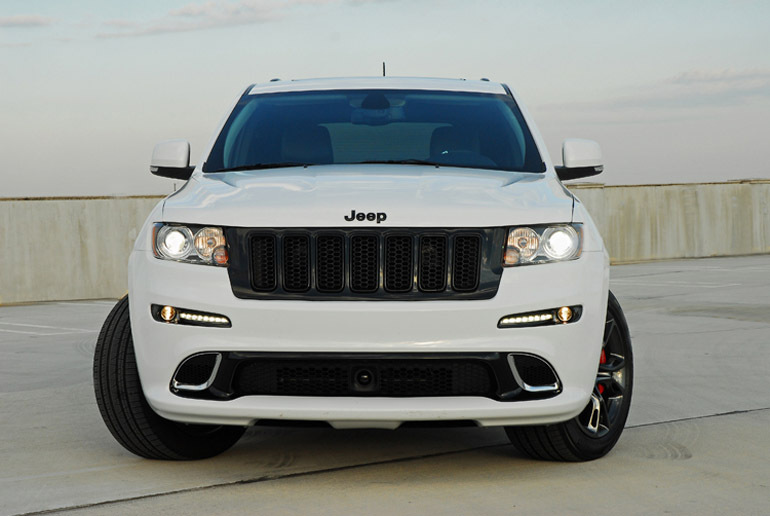 With so many full-size, high-performance sport utility vehicles on the market and to keep consumers coming back to the fabled brand, Jeep introduces for model year 2013 a new, exclusive Special Edition Bright White ‘Alpine’ Grand Cherokee SRT8. It is loaded to the gills and is the ultimate performance SUV. The unique bright white ‘Alpine’ paint scheme comes with black gloss trim up front, on the sides and in the rear, no chrome here. The new front fascia features a black Jeep hood badge, a black seven slot grille surround and inserts, Bi-Xenon headlamp clusters with a black surround, black incased premium projector beam foglamps combined with a strip of LEDs for the daytime running lamps, and a black lower air-intake with scoops at the sides with a L-shaped chrome surround to cool the giant brake rotors. The side view shows a black Grand Cherokee door badge, black low-profile roof rails, sideview mirrors with black gloss at the bottom, the only chrome trim located around the greenhouse, deep lower side extensions, and new aggressively styled Black Vapor Chrome finish on the 5-spoke 20X10 inch forged alloy wheels wrapped with Pirelli 295/45ZR20 inch Scorpion Verde all-season run-flat tires. 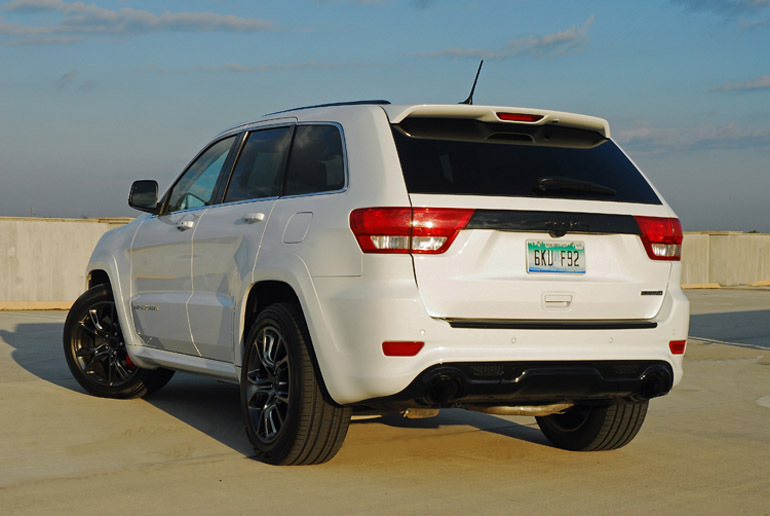 The unique rear features a blacked out Jeep badge on the center of the black gloss strip that mates the big wraparound lamp clusters, a black rear light bar and step pad, and a chrome SRT8 badge with black lettering on the power liftgate. Up top is a spoiler to enhance rear downforce and increase stability. Down below is a black gloss diffuser with 4 inch black gloss trumpet shaped dual exhaust finishers. The power dome hood features two working heat extractors with black screens. Standard features in the new SRT8 ‘Alpine’ that I tested includes premium leather door trim panels, instrument cluster, dashboard, dash shelf, leather trimmed with suede accents, Nappa leather, 8-way power adjustable/heated/cooled, SRT styled deeply cut bucket seats with power lumbar support, black/gray carbon fiber trim on the doors, instrument panel, dashboard each sitting in chrome channels, an aluminum metallic around the side air-vents, center stack and center console with dual cup-holders and a two-tiered storage box with a padded armrest, heated rear seats, ambient lighting, power liftgate, and an exclusive, beefy, power tilt/telescoping and heated leather-wrapped/chrome sheathed SRT flat bottom steering wheel with paddle shifters for hands-on-the-wheel shifting both on road and at the racetrack. 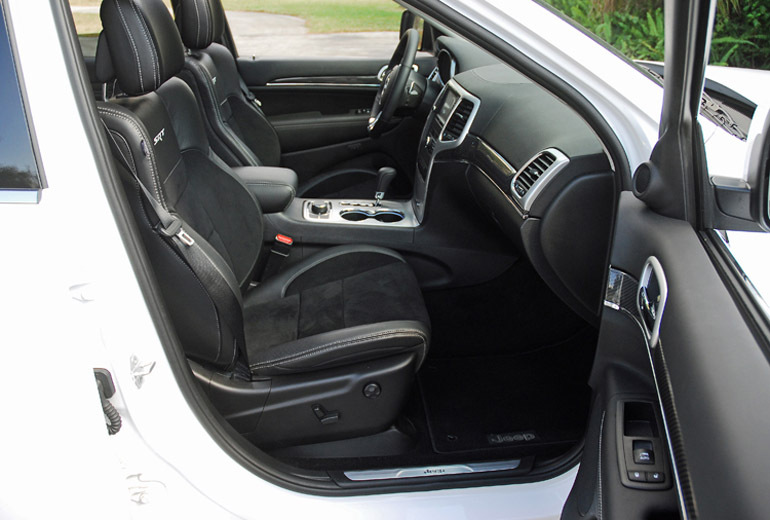 My Grand Cherokee SR8 ‘Alpine’ came with the optional rear DVD entertainment video system with headphones and remote control, one-touch power sunroof and a monster SRT high-performance Harman-Kardon Logic 7 GreenEdge amplifier with 19-speakers and a subwoofer. Standard safety systems include adaptive cruise control, forward warning, cross path detection and Blind-spot Monitoring. This new ‘Alpine’ edition is loaded with luxury and the latest infotainment/safety features but there is even more in store inside and under the stunning sheet metal. 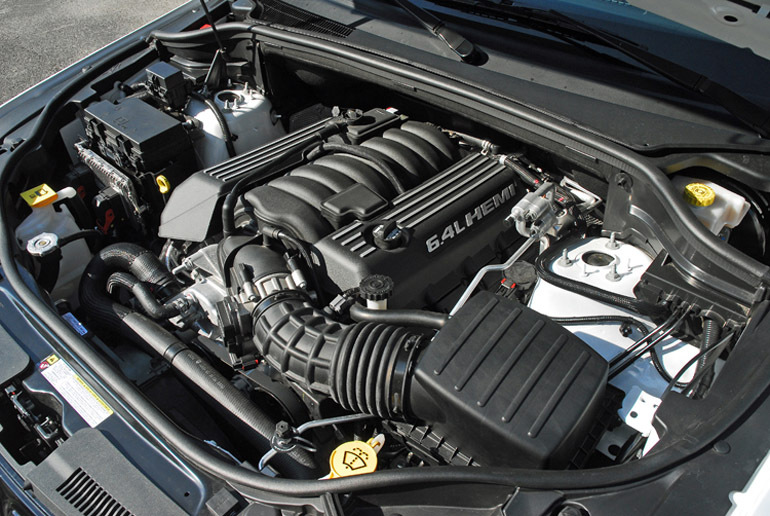 Under the hood is the start of the SRT massage of the engine, powertrain, steering, suspension and braking systems. Powering this new SRT8 is the 6.4 liter HEMI V8 with fuel saver technology that delivers 470hp at 6,000rpm and 465lb.ft. of torque at 4,300rpm. All of this power and torque moves this 5,150 pound sport utility vehicle to 60mph from a standstill in just 4.8 seconds, covering the ¼ mile in just 13.5 seconds, with a top speed of 160mph. My neck and back got sore every time I blasted the truck putting pedal to the metal for exciting thrills. This is one fast truck! The engine also comes with standard Fuel Saver Technology and an active valve exhaust system that allows four-cylinder ‘Eco’ operation to engage over a wide rpm range, delivering both fuel efficiency and an extended range of up to 450 miles on one tank of gas. 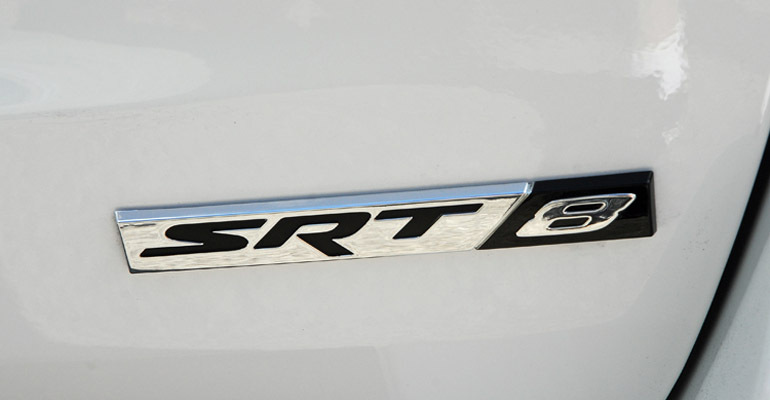 EPA specs for this SRT8 Grand Cherokee are 12mpg/city and 18mpg/highway. A thrilling ride does come cheap with any ultra-high-performance vehicle. The standard steering wheel mounted paddle shifters join the standard Auto Stick on the floor for manual shifting capability. Both are mated to a proved 5-speed automatic transmission with a 3.70:1 final drive ratio and a ZF electronic limited slip differential to put all of the power down on the road. Both the paddle shifter and Auto Stick allow a choice of spirited instantaneous shifting on the road or the racetrack. Both methods give you the ability to shift while the transmission controller calibration prevents situations that might over rev the engine. Fully adaptive electronic control of all shifting makes the powertrain more responsive while minimizing harshness. I used the paddle shifters that were so much more convenient and easy to use. In 2011 all Jeep Grand Cherokee models received a vastly improved and refined unitized body for a more refined on-road ride thanks to the new steel body structure. Torsional stiffness was improved 14 5% versus the previous generation model, for improved ride, durability and reduce noise, vibration and harshness. The improvements were achieved with more than 5,400 welds in the body alone, marking a 53% increase in spot welds, a 42% increase in arc welds and a 38% increase in structural adhesive. This stiffer, more torsional body structure plus SRT’s tuning and suspension geometry make the new Grand Cherokee ‘Alpine’ SRT8 the best handling Jeep vehicle ever-capable of .90 g on the skid pad-a features a SRT-tuned adaptive damping suspension managed by the Jeep Select-Track system that interacts with several different systems (stability control, adaptive damping, transmission shift strategy, transfer case torque proportioning, electronic limited slip differential performance, throttle control and cylinder de-activation) to automatically tune the dynamics of the vehicle. 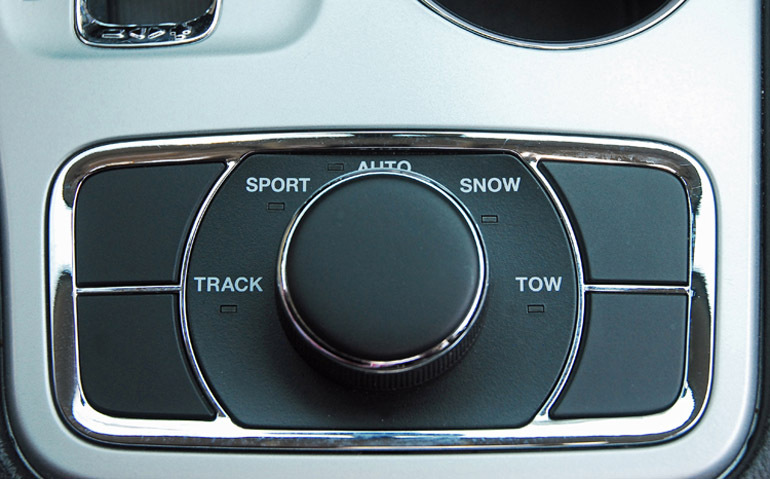 You can manual choose between five dynamic modes for specific driving conditions by tuning a large rotary dial on the center console: Auto-provides the most compliant ride and automatically adapts to any road situation using the adaptive suspension tuning; Sport-provides enhanced body control for a sporty, fun-to-drive ride for the street; Tow-provides a safe reduction in pitch and bounce for enhanced towing capability up to 5,000 pounds when properly equipped; Track-provides the high-performance, firm, ‘track-tuned’ suspension option to lock down body motion for the ultimate handling experience; Snow-provides the most conservative dynamic mode, so the vehicle will safely stay in-line in inclement winter weather conditions. This system allows you to alter the suspension to suit your way of driving in any giving road or track situation. It works very quickly and is just perfect for your current mindset. The standard Jeep Quadra-Trac SRT active on-demand four-wheel-drive transfer case uses input from a variety of sensors to determine tire slip at the earliest possible moment and take corrective action. The system uses Throttle Anticipate to sense quick movement in the throttle from a stop and maximize traction before slippage occurs. When tire slippage is detected, the Jeep 4X4 system can transfer up to 100% of available torque to one rear wheel. The transfer case also enhances handling by proportioning toque between the front and rear axles to maintain your intended path. The torque split is 40/60 in automatic, 50/50 in snow and 35/65 in sport or track modes. 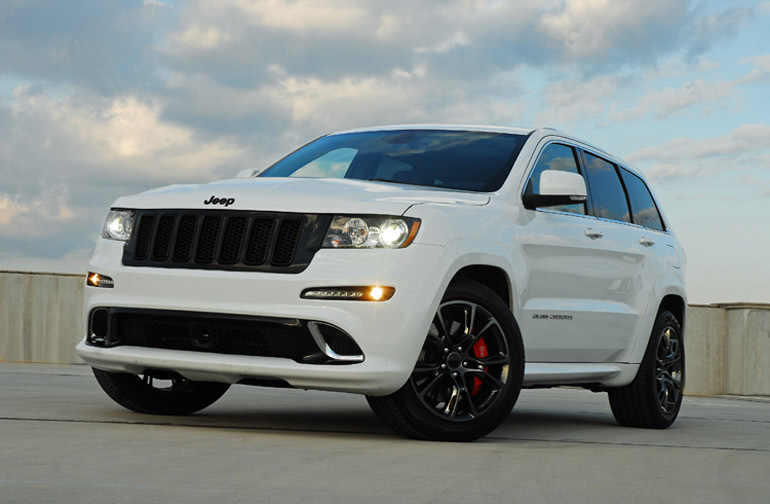 The Grand Cherokee SRT8 also features a ZF electronic limited slip differential which eliminates rear wheel slip and improves handling. The SRT tuned fully independent suspension features a SLA (short/long arm) setup with coil springs, Bilstein adaptive gas-charged shocks, upper/lower control arms and a stabilizer bar. The rear is a multi-link setup with coil springs, Bilstein adaptive gas-charged shocks, aluminum lower control arms, independent upper links (tension/camber), a separate toe link and a stabilizer bar. The feeling is like riding on rails as straight-line stability is rock solid and when you turn it is like you are ‘riding on rails’ as it stays flat, even when attacking the steepest curves. This rock-solid ride is enhanced with the SRT performance-tuned, fully hydraulic rack & pinion steering system that uses a heavy-duty pump and pump cooler. The revised gearing gives you a more direct feel, instant response, like a racecar, and better on-center response and feel. It couldn’t be better. 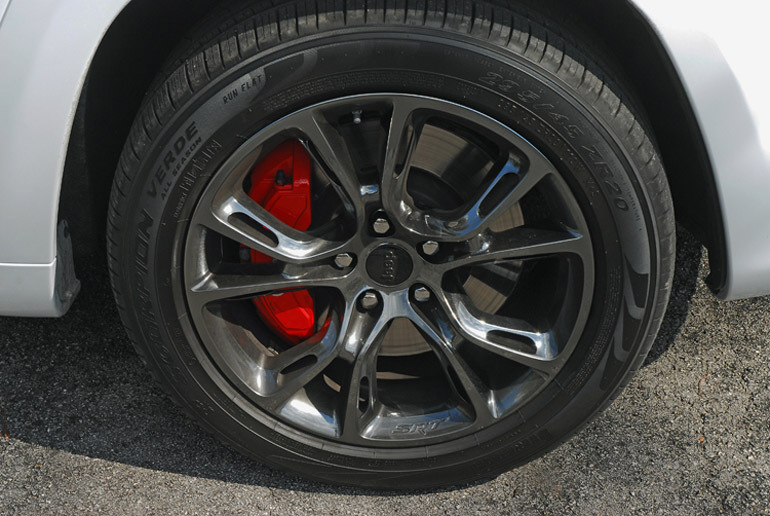 World-class stopping power is a hallmark of SRT and it is seen in this new SRT model. Up front are massive 15 inch vented discs clamped with Brembo six-piston calipers housed in aluminum, while 13.8 inch vented discs clamped with Brembo four-piston calipers are in the rear. 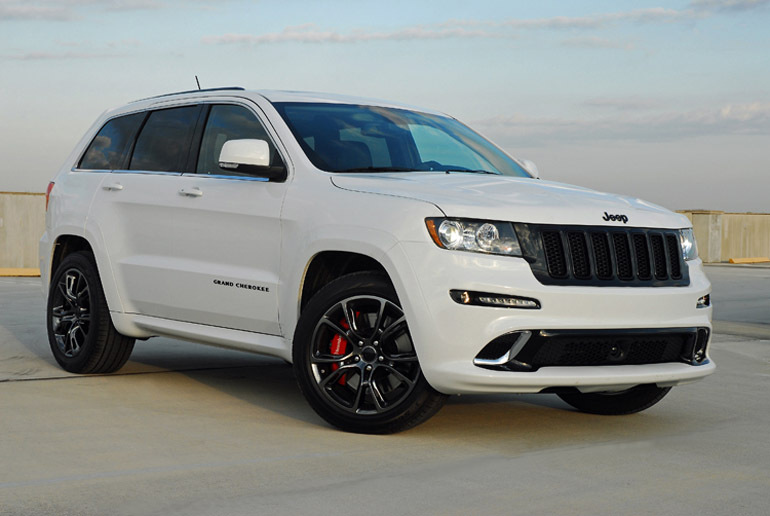 This ultimate braking system slows the new Grand Cherokee SRT8 down from 60mph to a stop in just 116 feet. Standard ABS and electronic stability control plus traction control keep you in control during severe maneuvers and when braking hard on wet or slick pavement. Under the sheet metal the new 2013 Jeep Grand Cherokee SRT8 ‘Alpine’ contains all the muscle and high-tech mechanicals to make it one of the fastest and best handling of all full-size 4X4 sport utility vehicles. All at your command instantly. 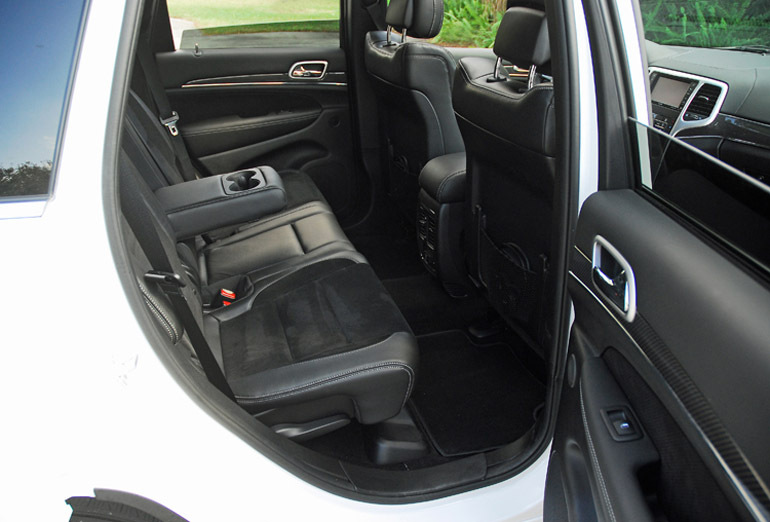 Inside nothing is left to the imagination of what makes a world-class luxurious sport utility vehicle. Each door opens wide for easy entry and exit with grab handles above each door. 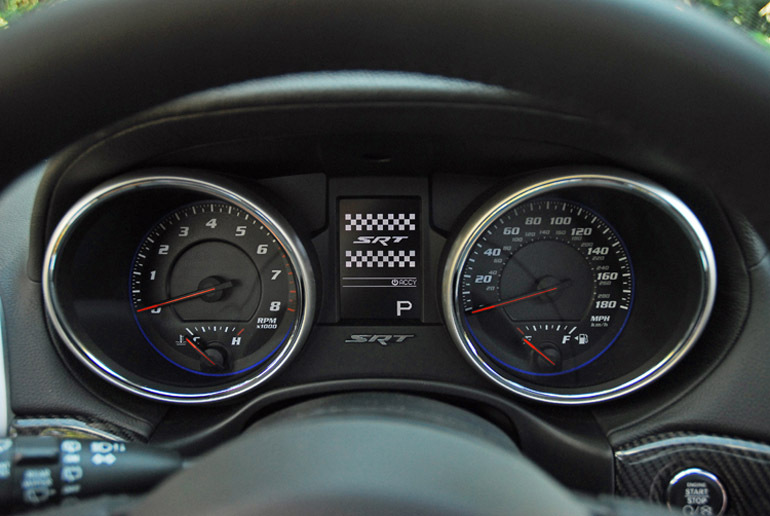 The standard SRT layout is a race-inspired cockpit. The rallye gauges are easy to read and the electronic vehicle information center (EVIC) controls are accessible from the horizontal spokes on the steering wheel. SRT-exclusive Performance Pages show instant feedback on steering input measurements, horsepower, torque, 0-60 mph time, 60-0 braking distance, G-forces, and 1/8 and ¼ mile times along with an expanded readout of engine information. Aluminum metallic trim covers the center stack, console and chrome gated leather-wrapped stick shifter perfectly place for easy use. Standard equipment not mentioned above includes dual map lights, sunglass holder, universal garage door opener, ParkView rear back-up camera, ParkSense rear park assist system, keyless enter & go push-button start/stop, map pockets behind the front seatbacks, reading lamps, flipper glass on the power liftgate to more conveniently load or unload cargo, air-vents behind the front console, security alarm, rain-sensing wipers and washers/rear wiper/washer, dual-zone climate control system GPS navigation with a 6.5 inch color screen, power windows/door locks with front express up/down, forward collision warning with radar sensing cruise control, remote fuel filler door, remote USB port, Uconnect 730N CD/DVD/MP3/HDD/NAV/AM-FM audio system with 9-amplified speakers and subwoofer, power/heated/self-dimming sideview mirrors, self-dimming rearview mirror, rear seats with pull-down armrest and double cupholders, chrome slats in the rear cargo hold with four-chrome tie-downs, 12-volt plug and underfloor storage, thick cut-pile carpeting with floor mats front/center and rear with a cargo cover. 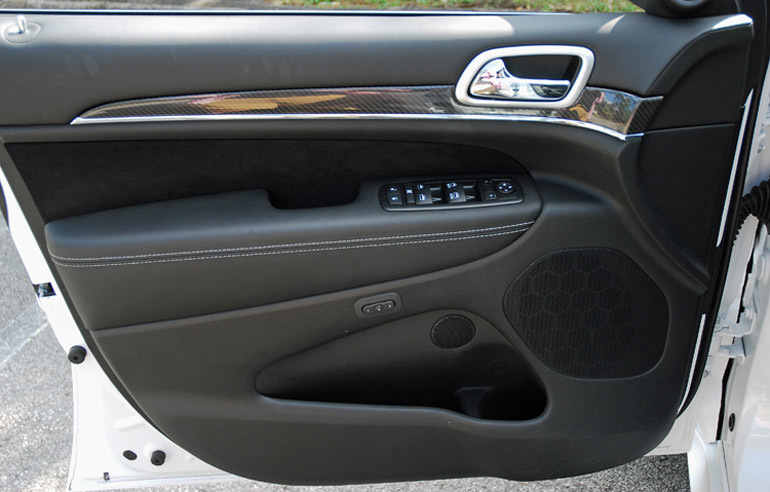 Standard safety systems not mentioned above includes LED running lamps, 3-point safety belts for all seating positions with front pretensioners/load limiters, front supplemental airbags, side curtain front/rear airbags, front seat mounted side airbags, LATCH system for child seats, front/rear crush zones, and steel beams in each door. What else could possibly be left out in terms of styling, performance, power, comfort, convenience, luxury or safety? This was seven days behind the wheel of a contemporary, multi-purpose dream machine. Along the way I received praise for the looks of the new ‘Alpine’ from other truck drivers and people who came over to ask about the new vehicle at parking lots and gas-stations. 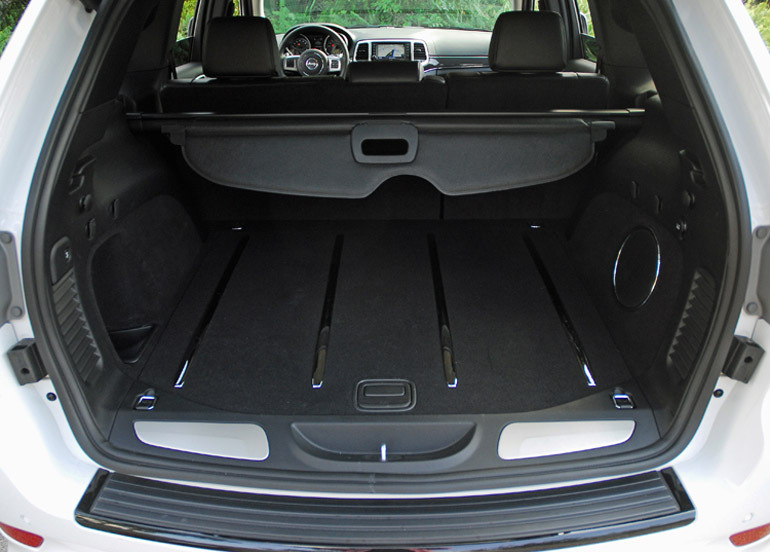 Cargo volume: behind rear seat-35.1/rear seats folded-68.7 cu.ft.